Machinist's Mates (MMs) in the Navy are responsible for maintaining and operating a variety of complex machinery, and assisting machinists in keeping all Navy craft in top working order. Most of the work they do is conducted on machines and engine parts within the hulls of Navy ships and submarines. 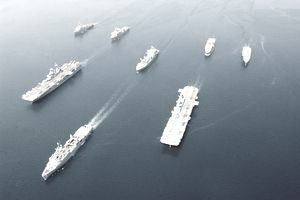 For instance, these sailors operate and maintain steam turbines and reduction gears used for ship propulsion and auxiliary machinery such as turbogenerators, pumps, and oil purifiers. They also maintain auxiliary machinery outside of main machinery spaces, such as electrohydraulic steering engines and elevators, refrigeration plants, air conditioning systems and desalinization plants. And, they may also operate and maintain compressed gas producing plants. Machinist's mates work within the hull of a ship in fire rooms, boiler rooms, engine rooms or shops. These locations are sometimes hot and noisy. Machinist's mates may be required to perform heavy physical work. They must be able to work closely with others and, in some cases, with limited supervision. After Navy basic training, these sailors spend eight weeks in technical training (or as the Navy calls it "A school") at the Naval Recruit Training Command in Great Lakes, Illinois. To be eligible to serve as a Navy machinist's mate, you'll need a combined score of 195 in the verbal (VE), arithmetic (AR), mathematical knowledge (MK) and auto and shop (AS) segments of the Armed Services Vocational Aptitude Battery (ASVAB) tests. You also can qualify with a combined 200 on the VE, AR, MK and assembling objects (AO) segments of the ASVAB tests. There is no Department of Defense security clearance needed for this job. Normal hearing is required, however, and will be tested prior to granting this rating. Vision must be correctable to 20/20 and normal color vision (no colorblindness) is required to serve as a machinist's mate.